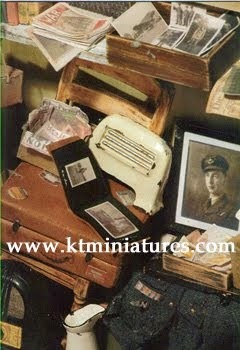 I promised Skegga Thorn that I would give her forthcoming Brick & Model Show a plug on KT Miniatures Journal. This is Skegga's third show and it is taking place in Naphill Village Hall, which is near High Wycombe in Bucks - UK. 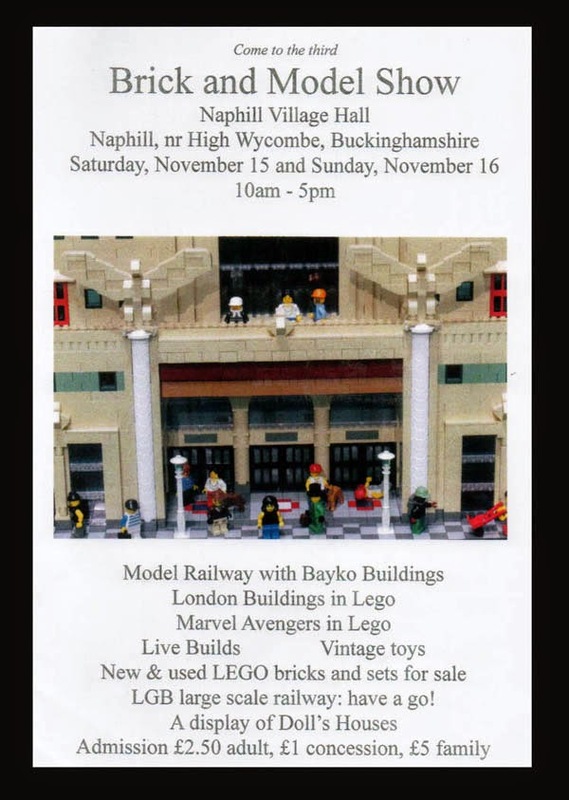 She tells me that it is for all ages and very much a "hands on" show where you can have a go at "building" yourself....so if you are down Buckinghamshire way over the weekend of the 15th & 16th of November, why not pop along and take a look. Did anyone have Bayko as a child? 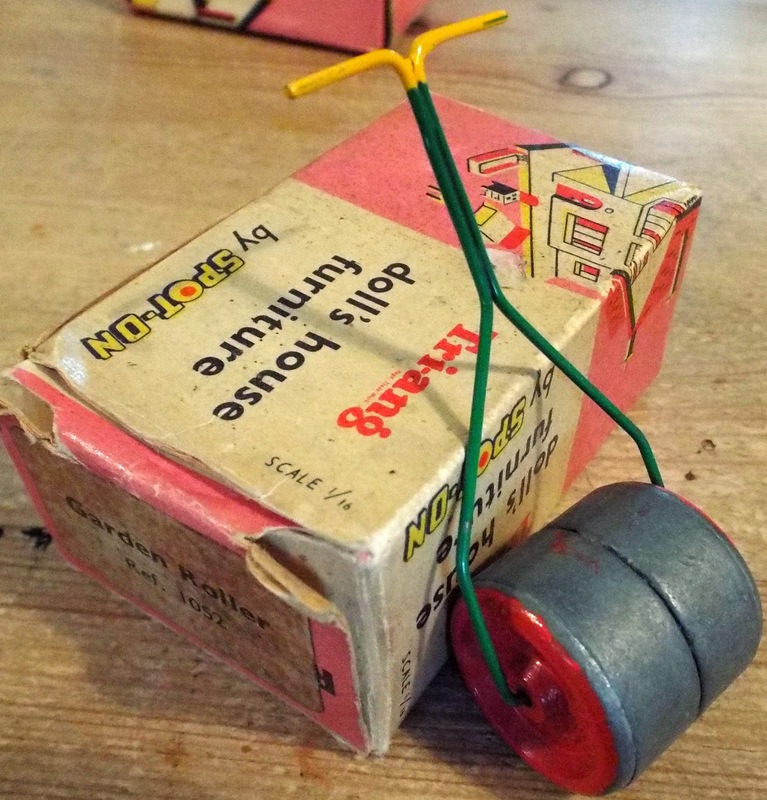 My brothers had an enormous box and I spent many happy hours constructing wonderful creations using the Bayko rods and slide in bricks. 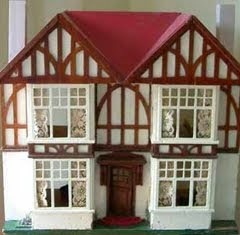 We only had one tiny shaped roof though and not many windows, so we had to use our imagination somewhat-great fun! 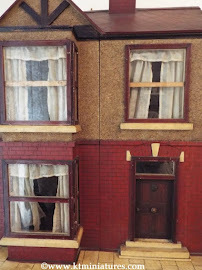 Sorry I was not able to do much listing of vintage items this week, but real life has been getting in the way....which includes builders and plumbers, and leaking water! Fingers crossed, life will revert to some sort of sanity next week. 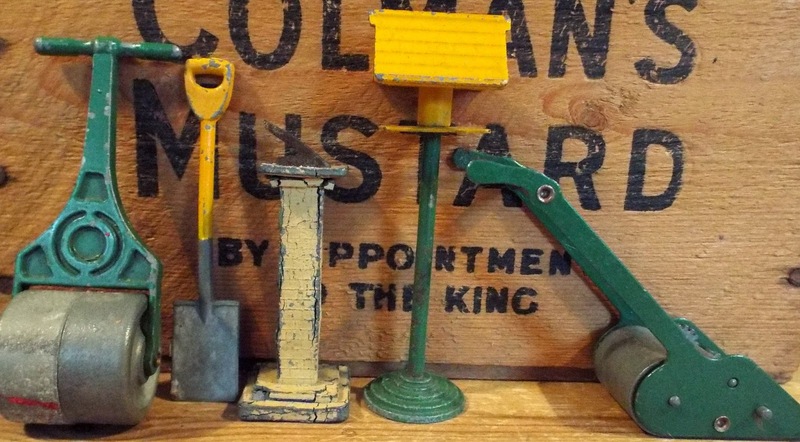 Identity Of Some Wonderful Unusual Miniature Garden Items! Recently some unusual vintage metal garden pieces came in and were finally put up for sale on Monday, after I'd spent some time in trying to identify them. 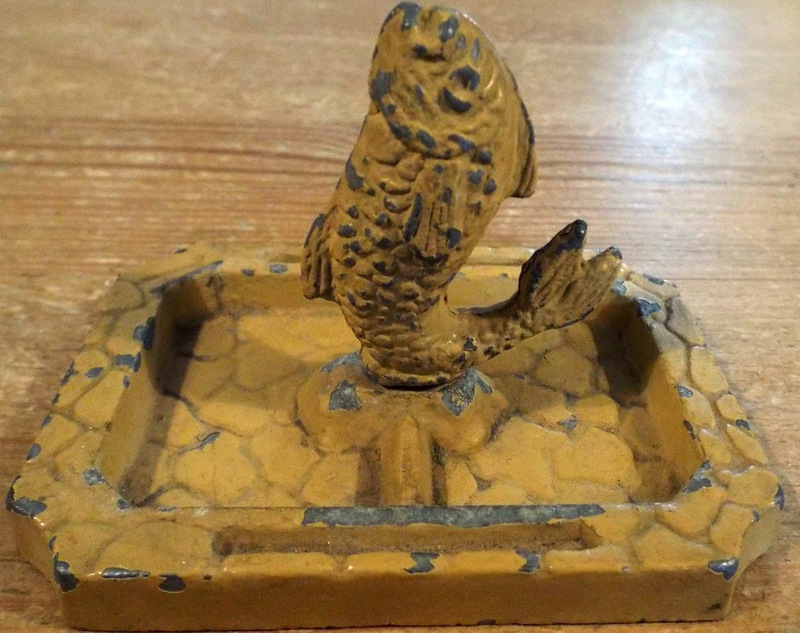 After much delving through all the literature I have here, finally I came across a photo of an identical pond with fish fountain, bird table and sun dial in THE GREAT BOOK OF HOLLOW-CAST FIGURES BY NORMAN JOPLIN. 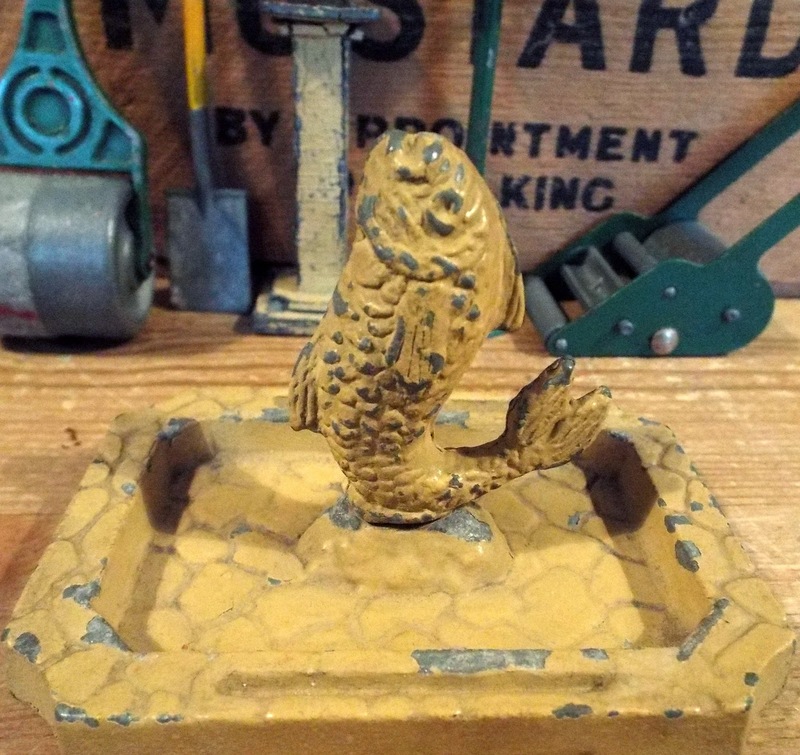 The author stated that he believed them to have been made by a London company who traded as B&S but very little is known about them....other than in 1950 they brought out a series of metal miniature garden items (this pond being one of them) and that they are absolutely nothing to do with the Barrett and Sons Company who often marked their products B&S. This lovely pond measures 3 1/8" long x just under 2 1/4" deep x approx. 2" to top of fish. It has MADE IN ENGLAND embossed underneath. Although it was made in 1950, it has a distinct air of the 1920s/30s/40s to me! Perhaps that is why I like it so much. I was so tempted to keep it but had nowhere to put it, so go it must! The fish fountain slots snugly onto the central point of the pond. The beige paint is a little worn in places but that doesn't matter - it all adds to the character I think! Needless to say this was snapped up very quickly as soon as it went up for sale. 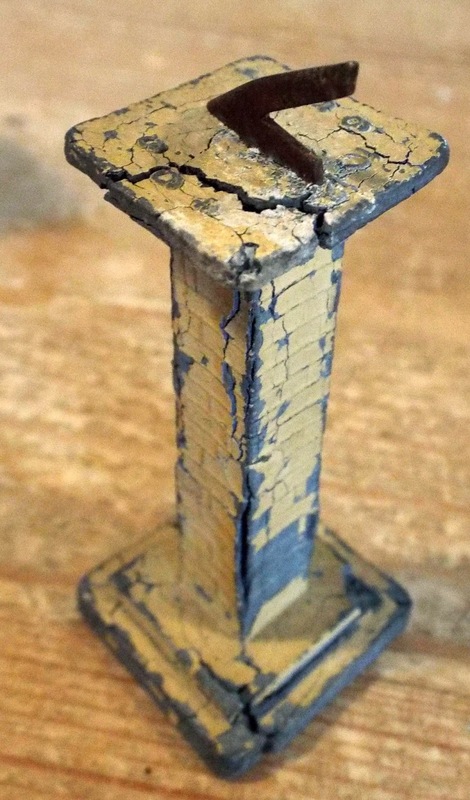 This bird table stands at a height of 3 1/2" high. 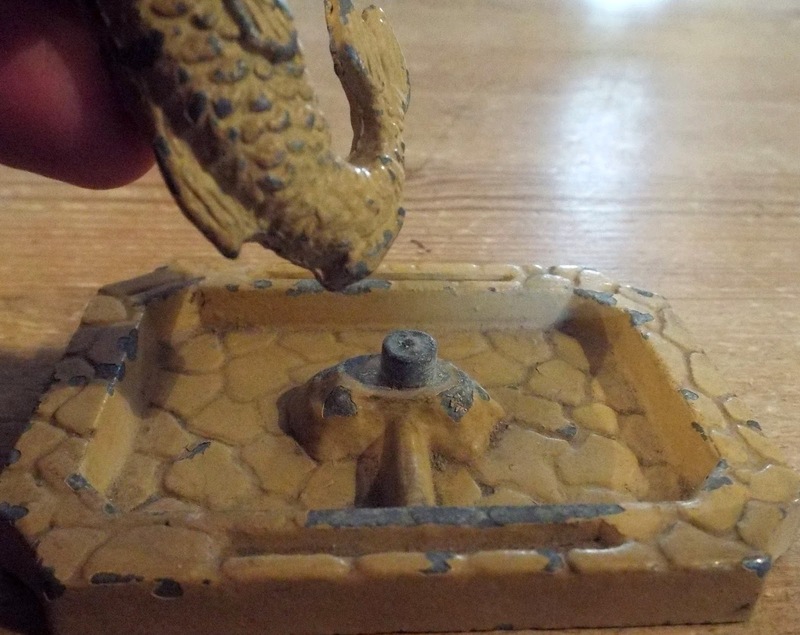 This beige painted metal sundial is suffering greatly from metal fatigue both on the base and top particularly. It measures 2 1/2" from base to top of dial. So the very heavy metal pond with fish fountain, bird house and sundial had been identified. 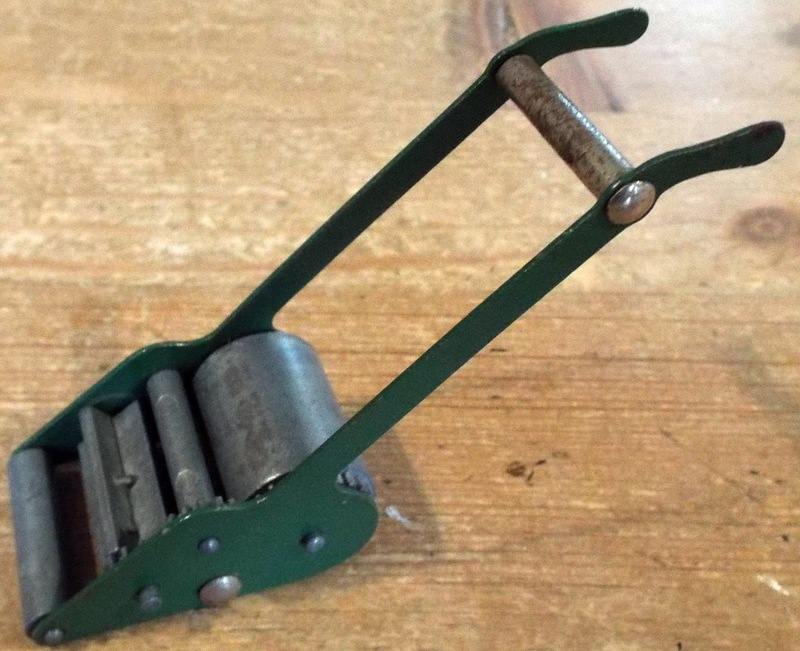 Am assuming that the spade and garden roller are also made from the same company even though they did not appear in Norman Joplin's book. The garden roller has MADE IN ENGLAND embossed onto the handle and both these items have the same "feel" to me as the pond, bird table and sundial. 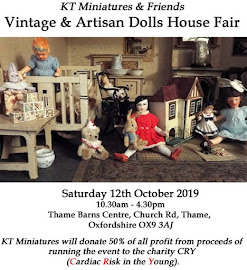 Anyhow...no sooner had these gone up for sale on Monday afternoon and a KT Miniatures Newsletter gone out, then a wonderful person emailed to say that she too had a pond just the same and knew what B&S stood for......"BYRITE & SELMORE". So there we are... it is very satisfying when a puzzle is solved! I must admit I don't know anything about Byrite & Selmore but needless to say, if anyone else out there can add anything to this, please do let us know - we would love to hear from you. This is not believed to be a B&S mower, as it is quite different from the one shown in Norman Joplin's photograph. It is obviously missing a grass box off the front but is exquisite. I don't know the maker but I have seen mowers like this once or twice before. As you push it along, all the rollers and cutter rotate! Does anyone know the manufacturer? Ok...I know this is not miniature related in any shape or form, but I thought I would show you what I've been up to, as I've surprised even myself with the result! 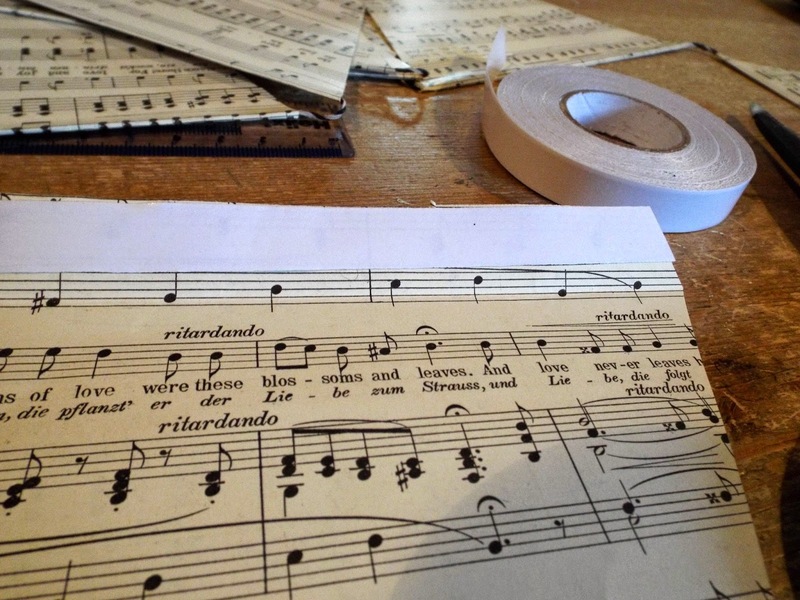 The other day my middle son's beautiful girlfriend (she is a music therapist) asked me tentatively if I would make them some vintage musical bunting for a "moving in present", as at long last they are setting up home together. How could I refuse? Even though the only bunting I 'd ever made up until now has been in 1/12th scale, I still felt quietly confident that this task should be relatively easy in comparison. 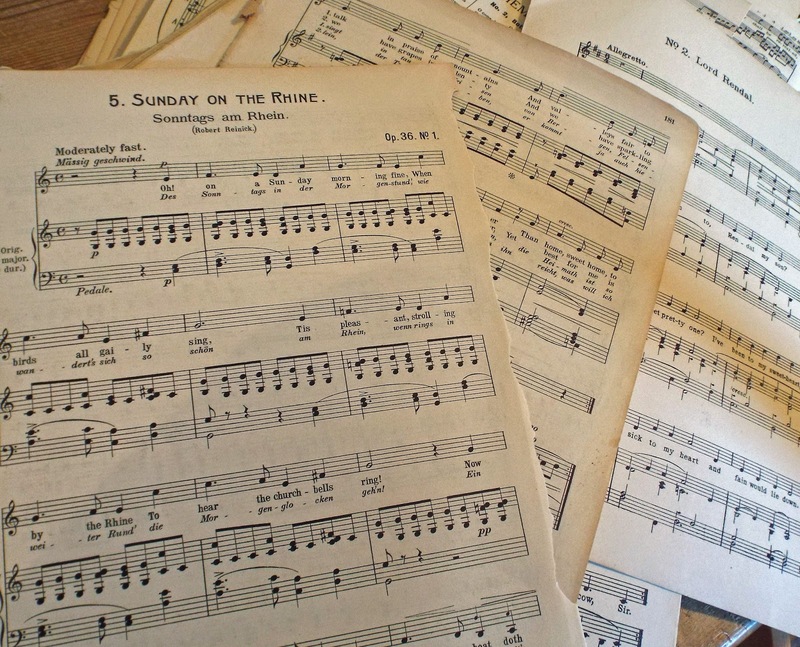 So....first up, I scoured our local car boot sale for old sheet music but to no avail, normally there are loads of old music/piano sheets around but not that particular day....typical! 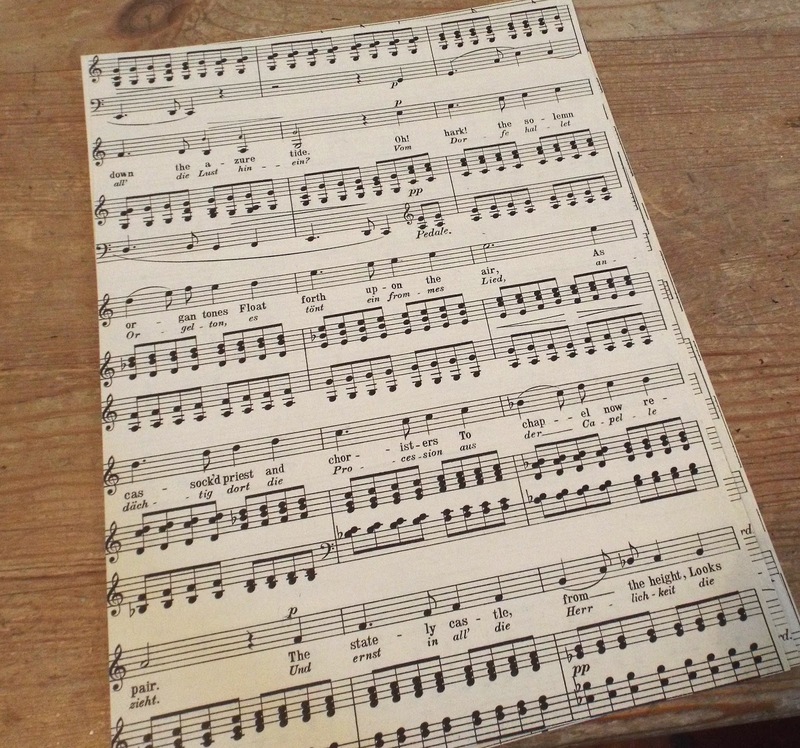 As time was of the essence, I then scoured Ebay and very quickly managed to obtain a whole bundle of random vintage music sheets of varying sizes really cheaply. They appeared to be from all kinds of old song books, ranging from hymns to folk songs. I chose pages from the folk song book.....as I thought they would be more apt and the lyrics more fun. 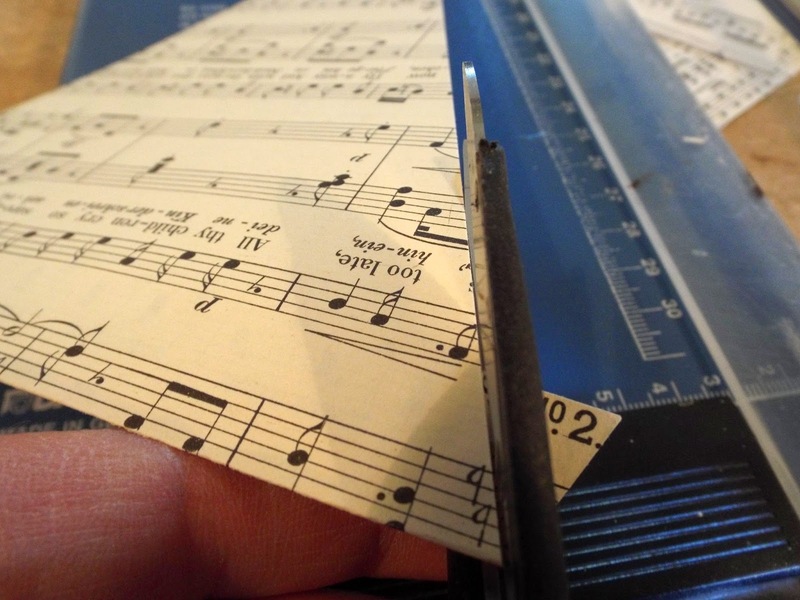 Next, I sliced up about 20 pages of music to make them all the same size using my guillotine. Then at the bottom edge of each sheet, marked the central point. After that, it was just a simple task of matching up top corners to the bottom central point and slicing up with the guillotine, to make triangular shapes. Hmm...I ended up with loads of interestingly shaped offcuts, and because it seemed such a shame to simply throw them away, they have all now gone in a carrier bag and stowed away until I can figure out what to do with them. I folded each top edge over by 1" and trimmed the excess off the top side edges with scissors. 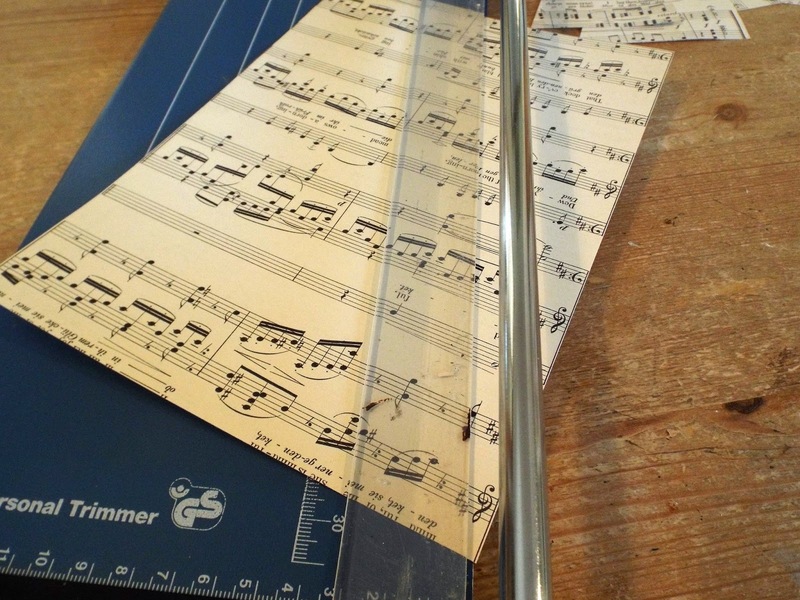 Next, along each very top edge, I carefully stuck a long strip of thin double sided tape. After wondering whether to use string, cord or material tape, I finally decided on using some old black and white thick cotton twine that had been stashed away in a drawer (I knew it would come in useful one day). Then as each taped edge was folded over, the twine was sandwiched inside along the fold. A gap of 1/2" was left in between each triangle, all along the twine. This was the trickiest bit of the whole project due to the fact that double sided tape was being used, as it meant that the fold and fixing in the twine had to be right first time. Unfortunately I discovered that if I stuck the folded bit slightly crooked, there was no chance of rectifying as the paper simple tore in trying to undo it all. Out of 20 triangles, I mucked up 4 so not too bad. 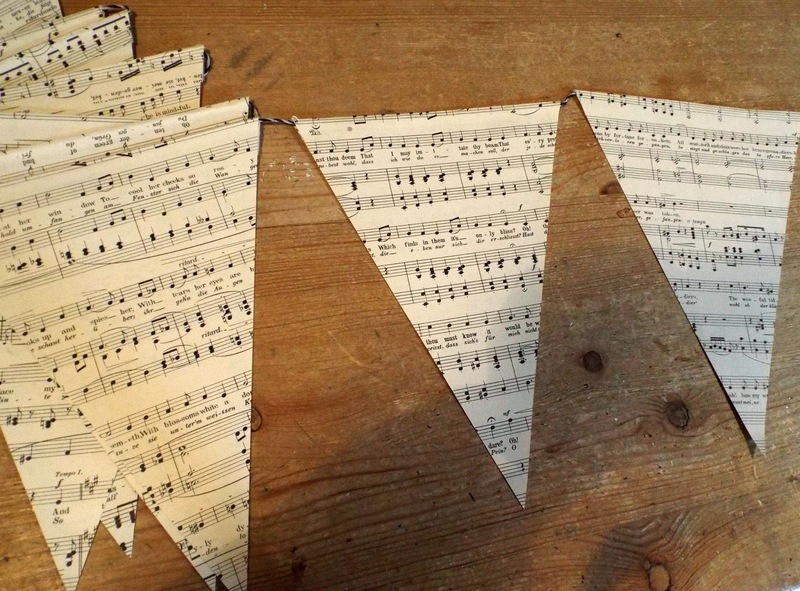 I still ended up with a very long piece of vintage musical bunting....yay! Am chuffed to bits with the result! 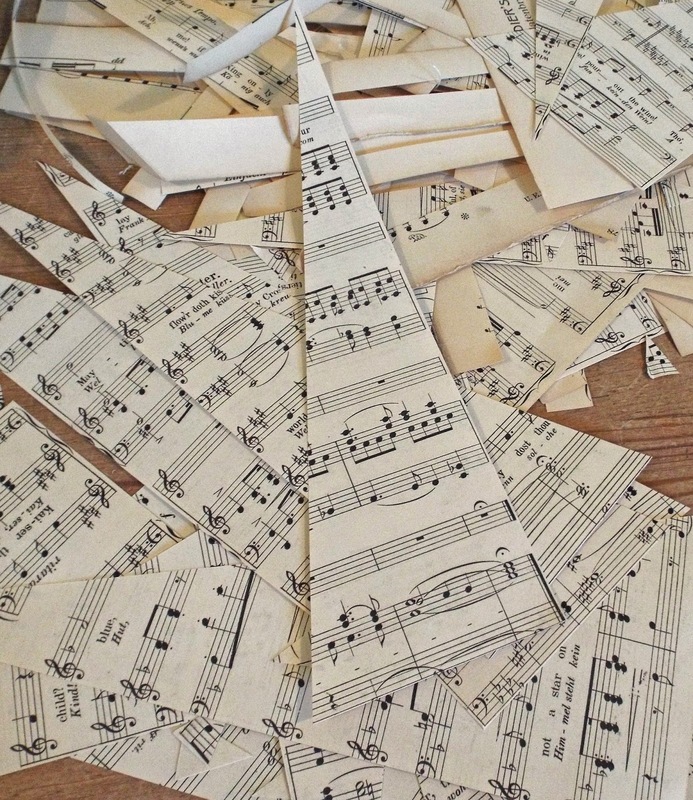 Hope this has inspired you too.....as this could be adapted using all kinds of old vintage paper....now my head is buzzing with all sorts of ideas! 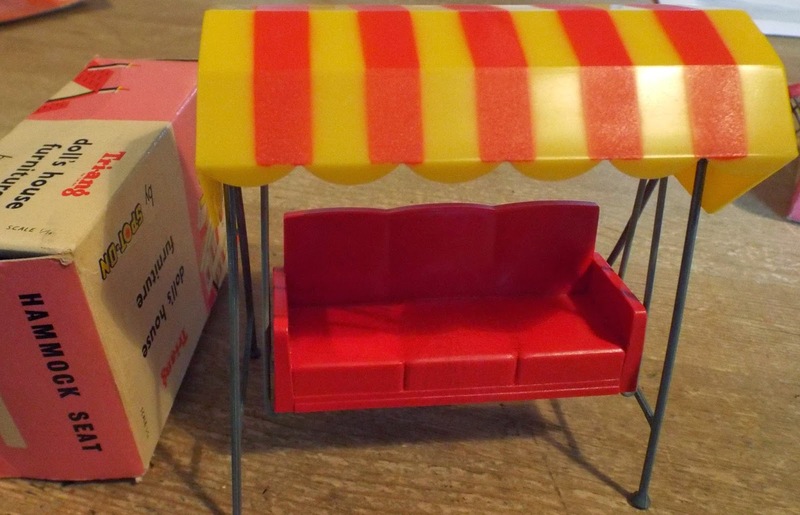 Over the past couple of days, I have been listing various vintage 1960s Tri-ang furniture and accessories to KT Miniatures website, and which are now for sale. 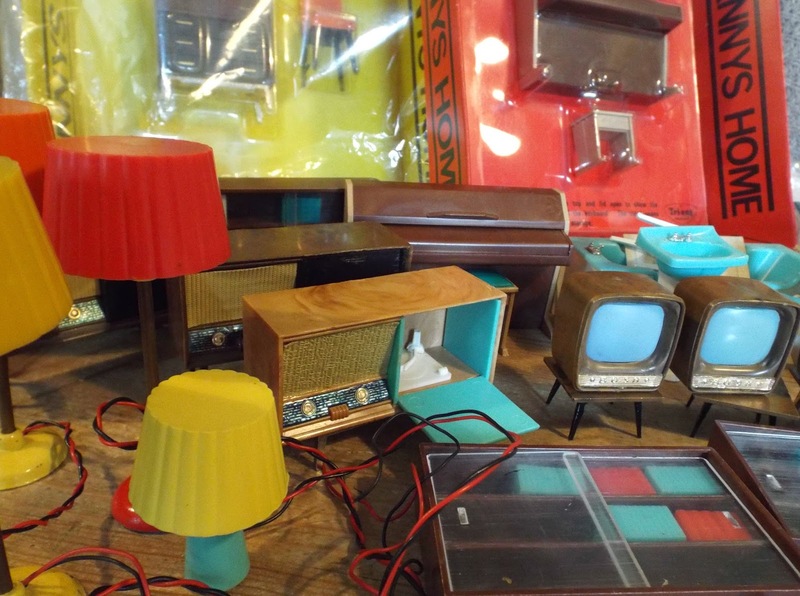 I have included multiple listings of certain item such as televisions and tables, bookcases, radiograms, lamps....to name but a few. 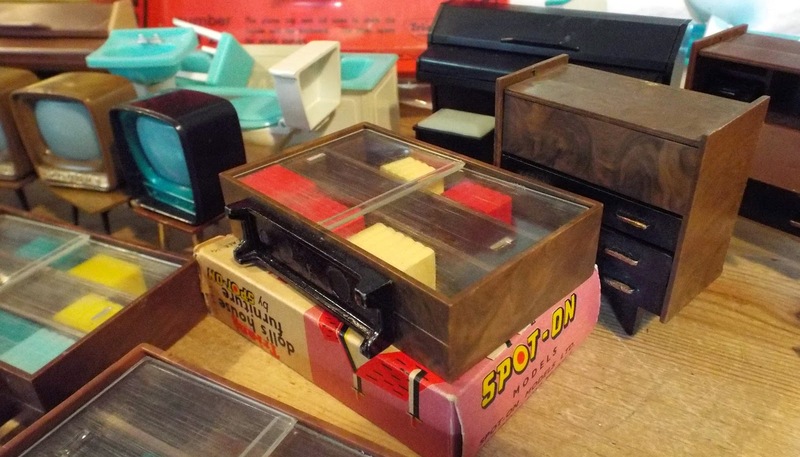 Even has the original box. 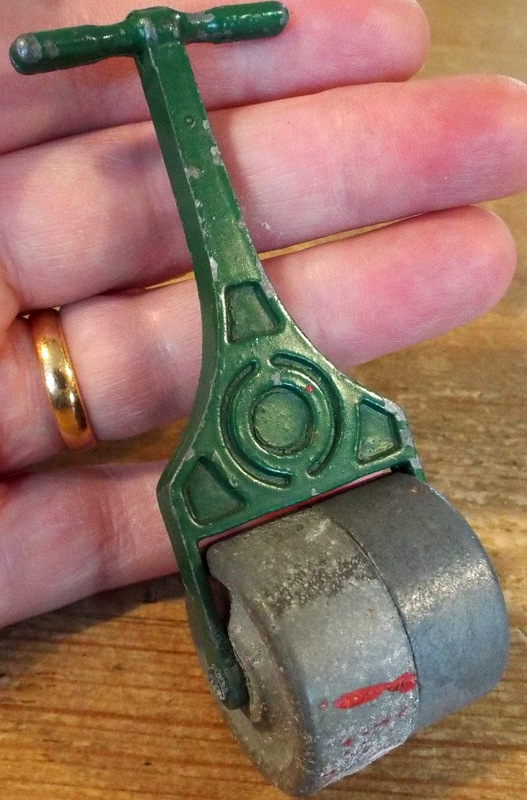 Then there is this Spot-On garden roller with original box...it is soooo heavy! 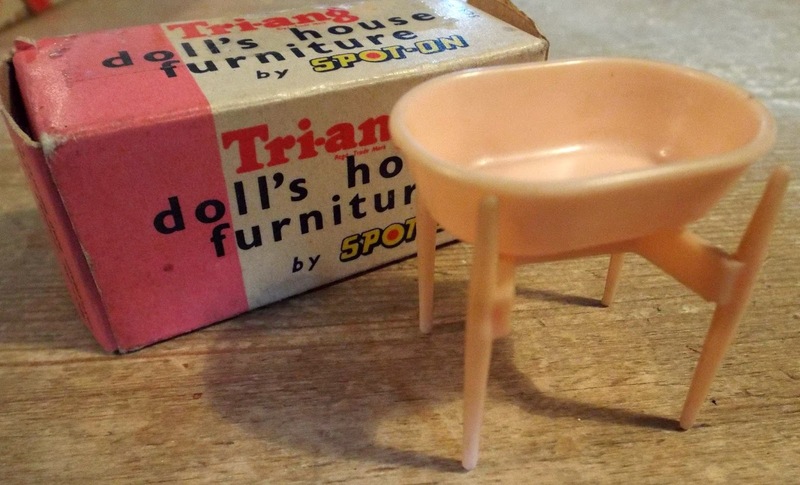 I have also just listed this delightful pale pink baby bath and stand with original box. There is a complete Spot-On bathroom set too. 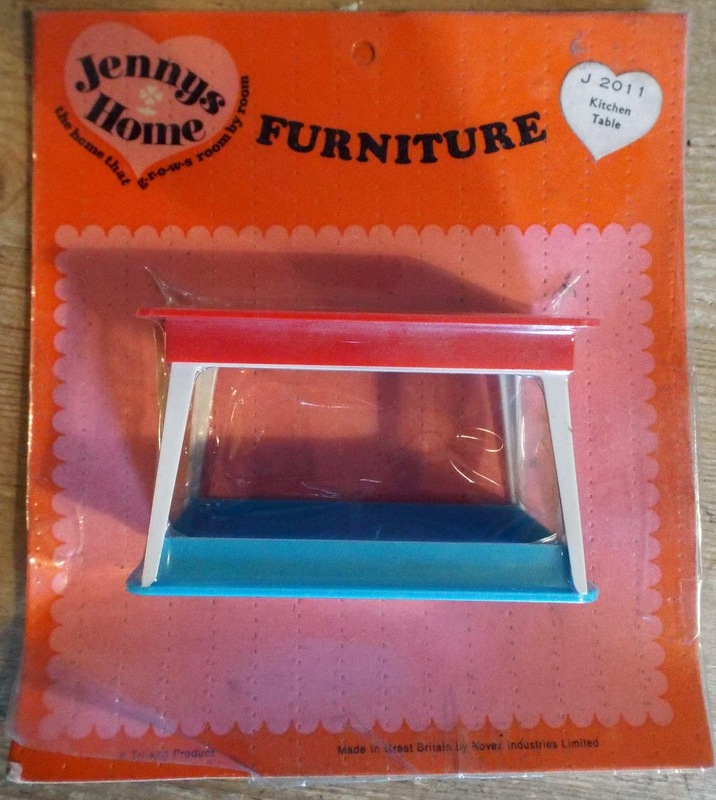 This late Jennys Home plastic kitchen table has an alternative table top.....what a fantastic idea! You have a choice of a red or blue table top and what's more, this has never been taken out of the original packet! 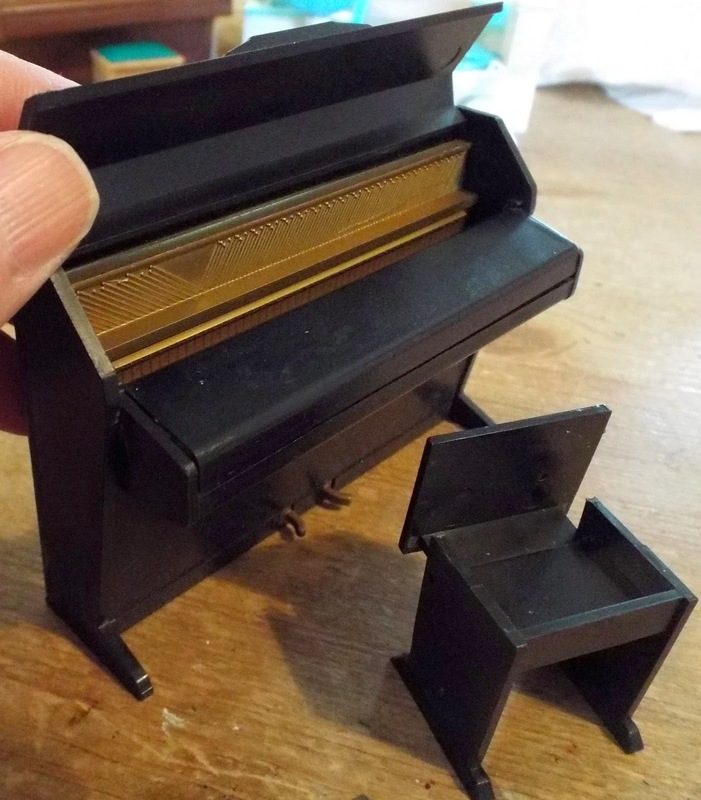 This is a particular favourite of mine...an Eavestaff piano, complete with lift up lid and top. 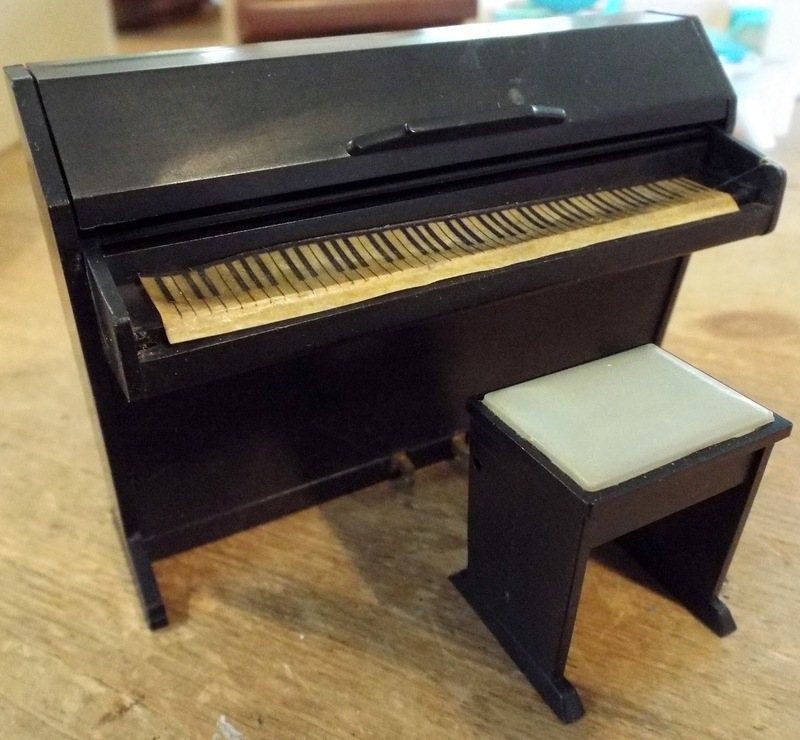 There is even the stool and the lid of that opens too, so you can store your miniature music inside! 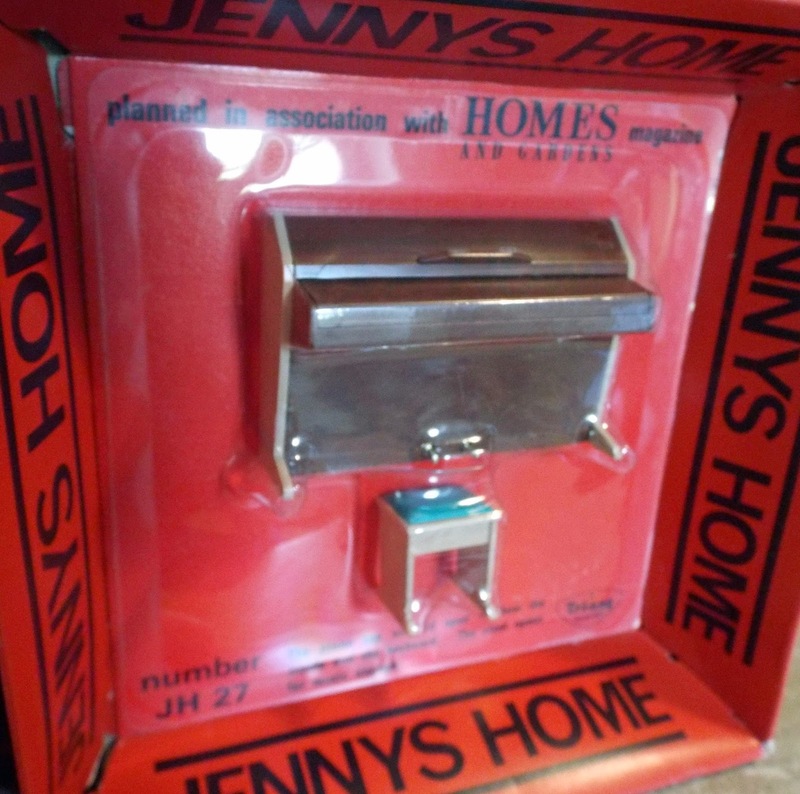 If you want a "brand new" vintage piano and stool that has never been played with, we have one of those too......a Tri-ang Jennys Home piano and stool still in the original packaging. I am hoping to list some more vintage Tri-ang over the next day or so...some of which can be seen in the photo above. 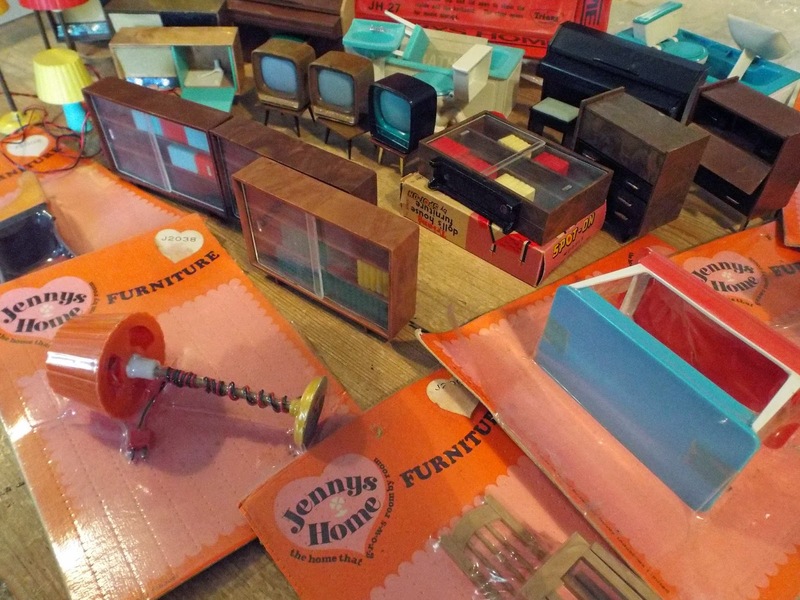 So if you have a vintage dolls house and are looking for some Tri-ang 1/16th scale furniture to fill it..why not go take a peek to see what's on offer...there is a large variety to choose from. Fascinating Glimpse Of A 1930s House In An Old Black & White Movie! Whilst researching for specific information on 1930s houses on the internet, I came across this fascinating 1930s black and white film of the Highbury Homes Estate, Cosham in Portsmouth. The film begins by showing us a wide variety of fireplaces, that residents on the Highbury Estate would have been able to choose from....my favourites are the wooden surrounds with built in over mantle mirrors. Then the film takes us on a tour around the house showing us labour saving appliances in the kitchen....just take a look at that sink and mangle, plus the gas cooker with the decorative frieze above the tiles and that maid saver with all the pull out "tea, coffee, sugar drawers", etc....absolutely fabulous! Then we are allowed a peek at the " modern indoor bathroom"....quite a luxury back then, with bath, sink and toilet. 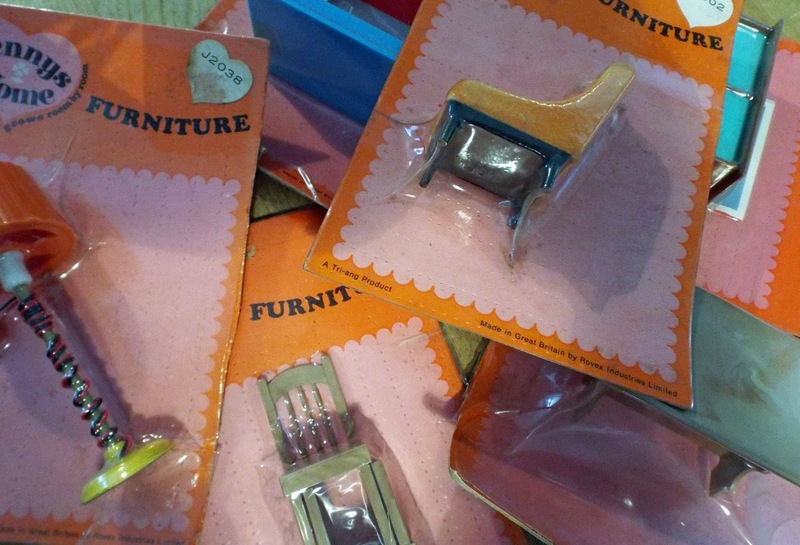 If you are interested in 1930s decor, or maybe needing authentic detailed information on interior decor for a miniature 1930s project (like me), you may find this very useful indeed. The film itself is a bit shaky and also a bit dark in places, but if you persevere it is well worth it. Towards the end of the film we are shown a selection of streets from the Highbury Estate which includes Chatsworth Avenue, Highbury Grove and Edgerly Gardens. Those same streets with these houses are still standing even now. If after viewing the film and you have quite a few minutes to spare, try typing in any of the above streets in Portsmouth (UK) on Google Maps and then tour around them in Street View - it is truly fascinating to compare what those streets looked like back then to what they look like now! After trawling through Street View of the estate, l was left wondering how many of the houses on that estate still have any of the internal original features remaining, ....haha, actually it is unlikely that none of them still have the gas cooker, mangle or indeed even the maid saver! In fact, I was so intrigued by all this that I hit on the idea of searching local estate agent websites via Google Search and sure enough, I found a random selection of houses from all three of those roads up for sale at the moment, complete with online internal images of each house. The results of this search were fascinating and surprising....although I found one of the houses that probably had the original bathroom suite, I don't think there were any of the original fireplaces left in any of the houses that I could see. Surely they could not ALL have been ripped out...they were beautiful! My goodness...how times have changed!